Cut the parts of the circuit boards that contain gold and put them in the bucket & throw away the other parts of the board. If you also have CPU chips hot them with a hammer as the gold parts are usually inside the chip. Place these in the bucket too. Take a clean 5 gallon bucket and either use aqua regia (nitric acid and hydrochloric acid) In the ratio 1:3. Remember to use gloves these are very hazardous materials. Place your CPU chips and cut up boards in a plastic wire mesh basket and then place this in the solution. The metal should start to fizz and give off a brown fume. (these fumes are toxic so make sure you are doing this process with an adequate mask or in an open area!) This chemical reaction is the gold dissolving into the acid solution, this process can take up to 2 hours so leave the boards in the solution for a while. Come back in 2 hours and check the boards to see that all the gold has been dissolved. The gold is now dissolved into the acid solution. This acid is reusable until there is no longer a chemical reaction of fizzing and fuming. Once the acid liquid is no longer reacting and dissolving the boards then remove the basket and check the liquid to see if any lumps of other material still remain in the liquid. If there are then filter this liquid or simply decant it into another container leaving the solid lumps behind. Your acid liquid should be a dark green clear liquid, if it looks cloudy or there are bits floating in it then you need to decant it or filter it until it is clear. Once its done then add some urea to the acid liquid little by little. It should react by fizzing - keep on adding the urea until the liquid does not fizz anymore. 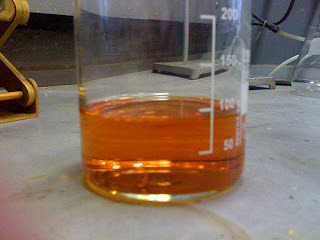 Once it has stopped fizzing you need to add precipitant to the acid liquid to extract the pure gold. You need roughly 1.5 spoonfuls of precipitant (Sodium Bisulfite (Na2HSO3) for every ounce of metal dissolved so remember to roughly weigh what you dissolved in the first place. Add the precipitant to a clean bucket and then add the acid solution. The precipitant and the acid will react forming a muddy solution that should sink to the bottom. This mud is your pure gold! To know whether you have extracted all the gold from the acid liquid - test some of the acid for gold content - using a gold detection liquid - if there is any gold in the acid still the gold detection liquid will turn purple brown. If there is still gold in the acid then add more precipitant. The acid should now be a clear green or amber color with mud sunk to the bottom. Pour off the acid into another container leaving only the mud. When the acid has been poured off add 2 or 3 gallons of water to the mud then pour off the water making sure you dont pour off any of the mud. The rinsing ensures the high purity of the gold. Test the mud with aqua ammonia for the purity of the gold. If it turns blue then you need to keep rinsing. Give a final rinse with distilled water. Once you are sure of the purity of the gold then you have your mud or powder. You can melt the powder and you will then have your pure gold. You have finished reading GOLD RECOVERY METHOD - Aqua Regia and many articles about Tech Gallery in our blog this, please read it. and url link of this article is https://littlebitjohnny.blogspot.com/2013/02/gold-recovery-method-aqua-regia.html Hopefully discussion articles on provide more knowledge about the world of new tech gadgets.